I can't wait for autumn either to get back into my jumpers. I love the pants, they look amazing with the blazer and the necklace is just, gorgeous! CHECK OUT MY BLOG GIVEAWAY WHERE YOU CAN WIN A DRESS OF YOUR CHOICE! My hair has totally sprouted so many fluffy bits recently, was a great look whilst camping...not. This outfit is gorj! 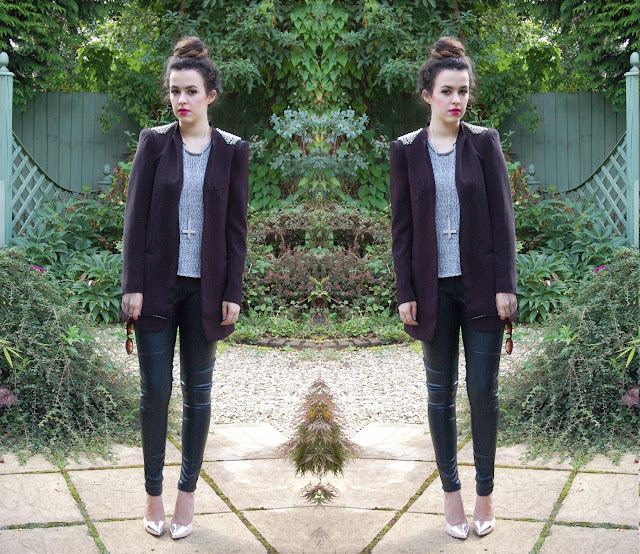 love the blazer and hand chain, and your hair looks lush up!! I love how you can still make a simple outfit look so interesting! I've had my eye on this blazer for a while and need to come to terms with parting with the cash! I can't wait for autumn, I can't seem to dress 'stylishly' for summer and can't wait to bring my knits and jumpers out of their hibernation. You look amazing as always by the way! That blazer is fabulous and I LOVE those trousers. Haha you do NOT look like the Weetos man! I love this look so so so much! <3 Your cat eye glasses are truly perfection - and look amazing with your red lips! Ah that blazer is to die for </3 and I know what you mean with the baby hair. I have it cuz I have curly hair and only super strength hairspray does the job of keeping them down. Love the vest and the detail on the blazer is amazing! i love the stud embellishment on the shoulders! amazing!! I love the blazer! May get it for winter! The colder months are much easier to dress for definitely, I'll finally be able to wear black without feeling silly! Those trousers are gorgeous! I saw this blazer the other day and thought how lovely it was! It looks great with the knitted vest and leather trousers. Teddy is looking lovely too! where is the blazer from? I just adore the studs. btw Your dog is adorable. This look is awesome. You surpirse me everytime I visit your blog. I love every little piece about this outfit. You look so amazing. Just WOW. hey ;) aww i Love your Accessoires and your studded jacket! Following from now on! I'm made up Autumn is on the way back too! They really do have the best clothes and yes...I'm probably white all year round as well! Absolutely love this studded jacket so much. The colour is so lovely. And you always have the best accessories! you are very beautiful and this just portrays true sophistication! I really love your blazer. The colour and the studs! Great outfit! That blazer is gorgeous, I just love the shoulder detail! & your doggy is super sweet! Those spikes are such an amazing touch to the outfit! This outfit is stunning. I absolutely love your blazer! Gorgeous, I'm loving the colours of burgundy and silver together. I read your interview on cocokouture (they interviewed me too! )and I love your blog and style! AHH I love this outfit. Major love for the blazer. I love Autumn too and this looks like the perfect outfit! I know exactly what you mean with the baby hair, mine has gone MENTAL recently! Such a beauty, incredible blazer!! I'm so excited to get back into knits and jackets and boots now, much more lovely than summer dressing!